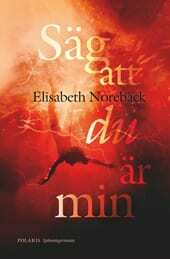 Elisabeth Norebäck reads a lot of suspense novels, and loves to watch crime and thriller tv-series. For years her husband has encouraged her to start writing herself. But what should she write? One day at the playground during her maternity leave, Elisabeth thought of every parent’s nightmare, what if your child disappears, just because you for a second leave her out of sight. How would you cope? For how long would you keep searching? And imagine meeting her twenty years later. Would you trust yourself and your sanity if all the facts indicates you’re wrong? What is your maternal instinct and intuition worth, when no one believes you? Elisabeth knew she had now found her perfect plot, and after two years of writing and rewriting, with only her husband as reader, Tell Me You’re Mine was finished. Elisabeth Norebäck lives in Stockholm with her husband and two children. She holds a Master of Science in Engineering from KTH Royal Institute of Technology and is working as a nursery assistant.